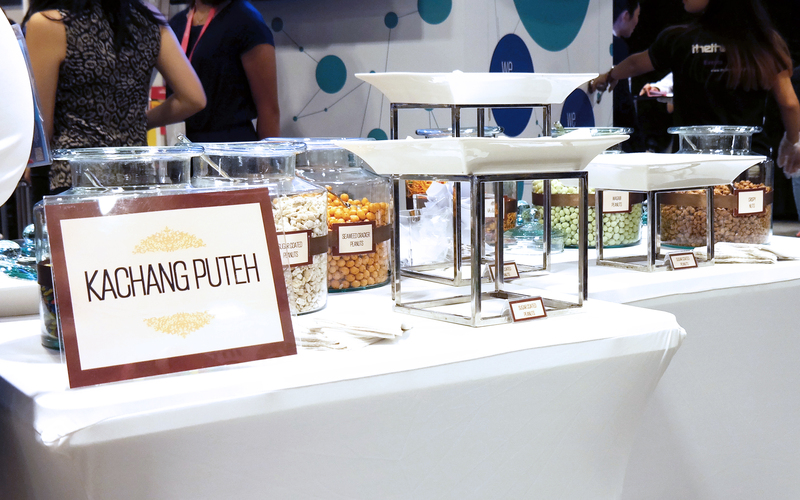 Besides free artisanal coffee, popcorn, and ice pops made out of soda, Singapore’s old school favourite, the kacang puteh, was one of the many free goodies that were available at Tech in Asia Singapore 2016. Tech in Asia Singapore 2016 was held on 12th and 13th April, at the Suntec City Convention Centre. Young and fresh-faced, we attended the event hoping to take away important learning points from the many talks (which we did, of course). Since we were there, we also jumped at the chance to speak to fellow start-ups to learn about their founding and journey. The event’s Bootstrap Alley was perfect for start-ups to gather and mingle, and so we made a beeline for it—not just for the kacang puteh. 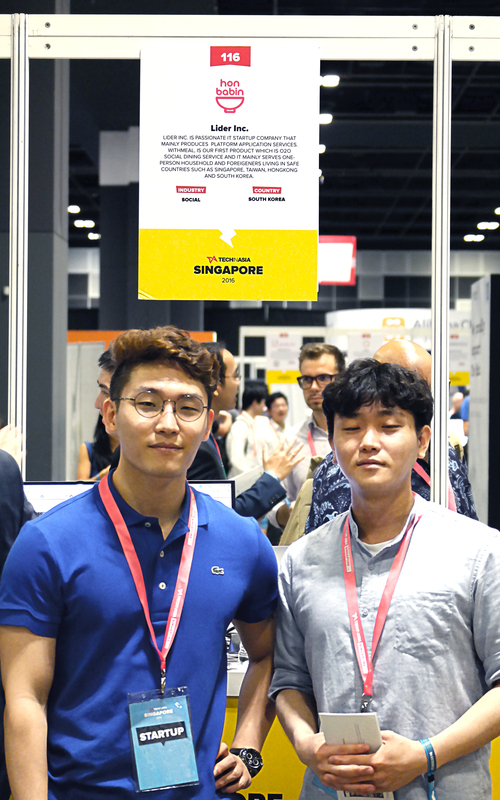 Kang Junyoung (left), Founder and CEO, with HW Kim (right), Co-founder and CSO of Withmeal at their booth in Tech in Asia’s Bootstrap Alley. The first booth we stopped by at Bootstrap Alley was run by a Korean social dining app, called Withmeal. Kang Junyoung, the well-conditioned CEO, shared that he started the app because he was always eating and having drinks alone. “It’s not sad,” he chuckled in defense. “People say it’s sad, so I’m like, ‘Why don’t we make a service where people won’t think it’s sad?’” He thought that such an app could perhaps help people with common interests—or at least similarly wired taste buds—get together. Users can choose to become a host or a guest. As the latter, they can look for events to attend based on a variety of categories, such as Sports/Diet, Business/Career, Culture/Arts, etc. 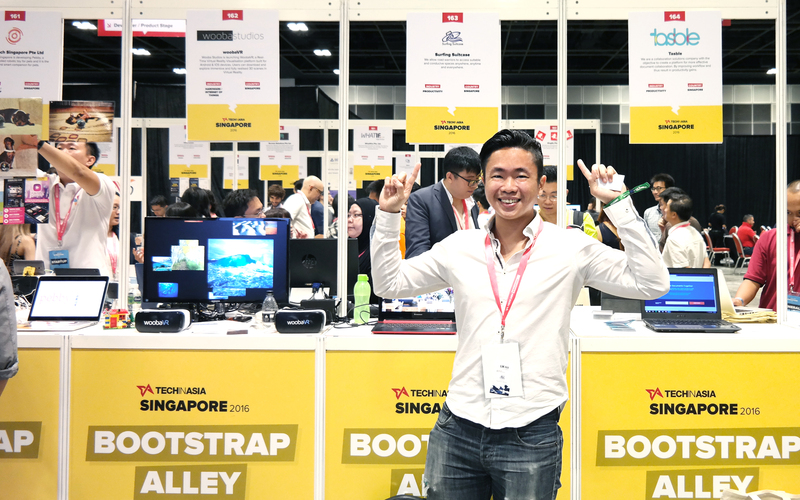 Lik Yeo, Co-founder of Surfing Suitcase, posing for a photo in front of his booth in Tech in Asia’s Bootstrap Alley. Intrigued by its name, we stopped by the booth of Surfing Suitcase (thanks to the ubiquitous bootstrap alley branding it was almost impossible to distinguish between the different booths). Co-founder Lik Yeo—his creative business card reminiscent of Hokusai’s ‘The Great Wave off Kanagawa’, dangling from his lanyard—was there to greet us and share his story. Surfing Suitcase is a mobile/web application that curates working spaces for small companies or lone workers. Unlike incubators, Surfing Suitcase does not own any of the places it finds for its clients. Almost like a real-estate version of our own TalentDash (we map out potential employees instead of real estate), the platform serves its users by helping them look for spaces based on their preferences, for example, having strong wifi, power points, or being quiet and conducive. 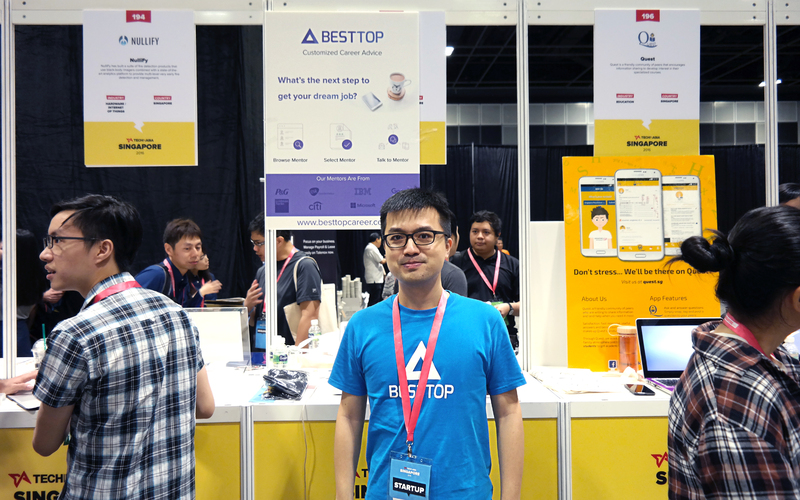 Tony Jin, Founder, and CEO of BestTop Career, at his booth in Tech in Asia’s Bootstrap Alley. As a talent-mapping platform, we felt that our concept resonated with BestTop’s tagline of “Customised Career Advice”, so we approached the bespectacled Tony Jin, founder, and CEO of BestTop, to find out more. “BestTop is a platform to facilitate the process of people looking to connect industry mentors. You can select the mentor that you’re interested in, and talk to them. You pay them hourly rates, depending on the mentor,” Tony explained. The platform offers two main services: Individual Career Coaching and Group Sharing Session; the former allows students to receive one-to-one coaching with their mentor, and the latter works as a networking group for students of similar goals, with one mentor. The one-and-a-half-year-old company is made up of two full-timers and two part-timers. The former being none other than the two founders, of course. “My co-founder mostly manages the financing, and I handle everything else,” Tony shared. As they are still relatively young, they are not able to afford full-timers, so the founders enlisted the help of their friends as part-timers. “You have to have the passion, and be reliable. Personally, I prefer reliability over competence. In young start-ups, you have to literally do everything. Everything is on-the-job training and everything is a learning process, so, the person must be willing to learn,” Tony explained. 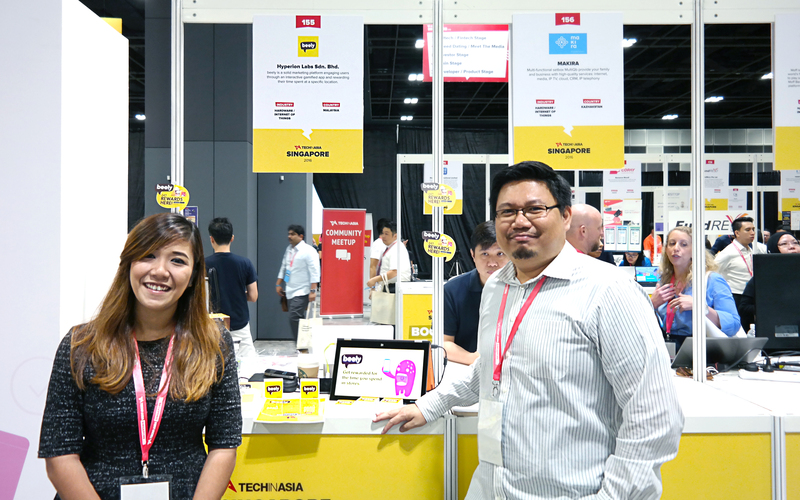 Ruby Balasingam, Assistant Sales Manager of Beely, and her colleague, Azri, in front of their booth in Tech in Asia’s Bootstrap Alley. Beely, which is based in Malaysia, is a “gamified point-farming” mobile application. It allows users collect loyalty points in stores via Bluetooth, saving users the hassle of having to take their mobile phone out and open an app for point collection. With that feature, users get to harvest one point for every five minutes spent in a Beely-powered location. The points can then be accumulated until users can use them to redeem special items. As users continue to use the app, they can accumulate experience points, which will enable them to level up and earn specials or collect bonus points. 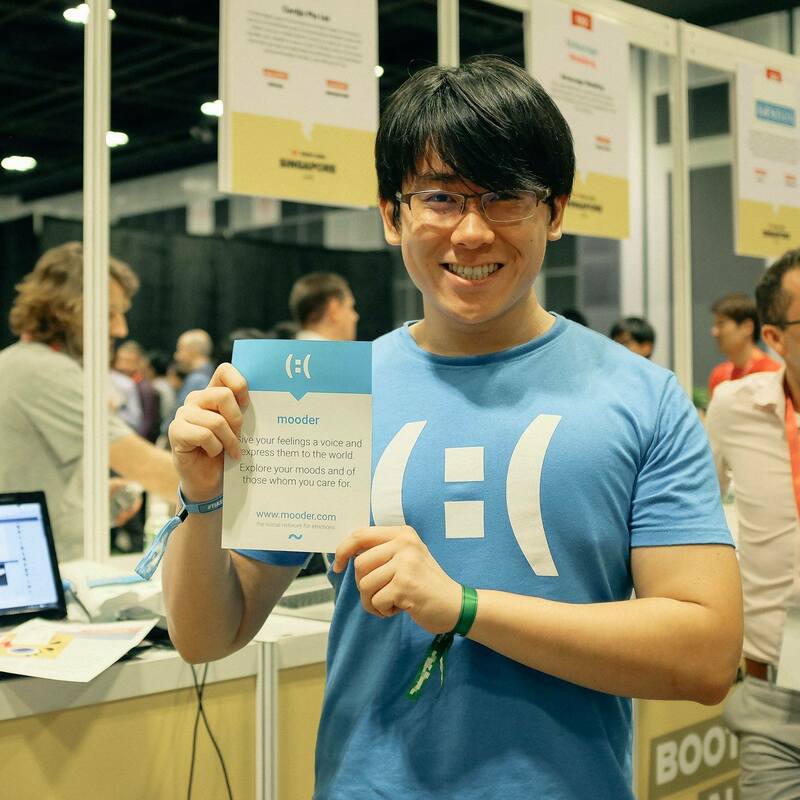 Jin Zhe, Founder, and CEO of Mooder, cheerfully promoting his platform at his booth in Tech in Asia’s Bootstrap Alley (Source: Jin Zhe’s Facebook). Mooder, with its quirky two-way smiley, piqued our curiosity. According to Jin Zhe, the founder, and CEO of Mooder, the logo serves to remind people that joy and sadness are polar opposites of each other and they can only be defined in terms of the other. “The complete picture of our emotions can only be appreciated when we have experienced both emotional spectrums equally. Essentially, Mooder’s logo is the ying and yang for emotions,” Jin Zhe explained. Having graduated with a degree in Computer Science from the National University of Singapore (NUS), Jin Zhe draws his inspiration from the likes of Bill Gates, Larry Page, and Mark Zuckerberg. He believes in the importance for a technical founder to put in the legwork of developing the initial product, and with that, Mooder was entirely developed by him in the span of one year. Dubbed as the “social network for emotions”, Mooder’s blue interface and three-column layout remind us of Twitter. “The Twitter-like interface was adopted to provide a familiar user environment to reduce the barriers of user-adoption,” Jin Zhe explained. The platform currently has over 450 users and 1,600 posts. “We intend to target the young demographic in the long run; people who seek to have an emotional outlet. The current user demographic comprises mainly of NUS students because they are the most readily available community to reach out to,” Jin Zhe shared. Our five start-ups show that every business goes through its own unique process of building its team and product. It is no secret that the team is one of the most important components of a successful start-up. Without it, who could build and perfect the product, or develop the business? Most of the time, however, limited funds can be the one roadblock to finding the right team members. It simply is too costly for start-ups to experiment with their most precious resource: the human resource. So, apart from taking a play out of these five companies book, allow us to introduce another way. Excuse the shameless plug of our very own start-up, but if you are in need of a team (member) for your start-up, we will find you just the person you are looking for—or didn’t even know you were looking for yet. Update at 10:30am (GMT +08:00): Mooder’s story has been revised due to initial inaccurate information. We would like to thank everyone who shared their story with us. If you have any interesting story to share, please contact us via email at admin@talentdash.com.